Petits Noirs, a chocolatier on the Oregon side of the Walla Walla Valley, aims to make chocolate-wine love connections. 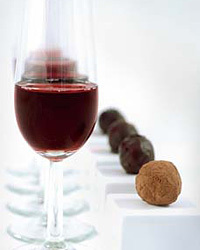 Its bonbons flavored with toasted anise seed and cardamom, for instance, echo notes in Syrah and Cabernet Sauvignon. 622 S. Main St., Milton Freewater; petitsnoirs.com.